Finish line shots of Scott and I at the 2013 Top of Utah Marathon. 1-2 Saucony sweep! Today was the Top of Utah Marathon. I went back and forth on running this year (after winning it last year). I wasn't sure how it would fit into my fall racing plans, but ultimately decided to run and I'm glad I did. My friend and teammate Scott Wietecha were able to go 1-2, I ran 2:23:33 (2nd place) without feeling like I pushed myself too hard, and our friend Allie won the women's race in a stunning 2:44. Below is my race recap, followed by some quotes from the newspaper article. Andrea's photos are scattered throughout. As always, she was my support team along the course and helps me out SO MUCH in the marathon. Pre-race thoughts / strategy / goals in my Fast Running blog post the day before the race. In summary, Scott and I wanted to go 1-2 while taking it somewhat "easy" if possible and saving our legs a bit. I was planning to run in the 2:28-2:30 range. The strategy, as expected, went out the window immediately when Seth Pilkington shot off the line into the lead, and he was closely shadowed by another guy I didn't know (Jesse Dunn). Scott gave chase a little, and I positioned myself about 10 meters behind him - determined not to get "caught up" in the early racing. After a couple comfortable miles (5:26, 5:31), the pace increased a bit (5:19, 5:16), Seth/Scott pulled away, and I made the decision to not chase them. Jesse fell back after 6 miles, and I just tried to maintain a steady effort. I didn't want to press too hard, but I also wanted to keep Seth/Scott in sight, just in case they started to come back to me. Next 7 miles were 5:24, 5:29, 5:27, 5:24, 5:23, 5:28, 5:28. They had a big gap on me through 10 miles, and then somewhere around that point I noticed that Scott was pulling away from Seth, so I picked it up a bit and reeled Seth back relatively quickly over the next two miles (5:21, 5:21). Split at the half was around 1:11:00 - two minutes slower than last year, but it felt even easier than that. Tailwind was strong coming out of the canyon, so mile 14 was the fastest of the race (5:14). Then on Hollow Road I really locked into a consistent groove - 5:24, 5:24, 5:24, 5:24. According to Mr. Timex, these 4 miles were all within two-tenths of a second of each other. A little past 18 miles Andrea gave me the update - Scott was a minute or so ahead, and Seth was about two minutes back. So it was time to decide whether to hammer the last portion or go into steady-hard-cruise control. I chose the latter and took it pretty easy up the Milleville hill (5:50, 5:42... although I overshot a turn by about 40 feet before realizing it - nearly a disaster!). Then it was really just about relaxing and keeping the effort under control for the last six miles - 5:33, 5:46, 5:46, 5:22 (oops, too fast! ), 5:38, 5:36. I finished second in 2:23:33. Scott ran 2:22:34 to take first. Seth ended up dropping out near 20 miles, and Jesse finished 3rd in 2:32. I couldn't believe how I felt at the end. No "wrecked" feeling like usual after 26.2. Not even a "semi-wrecked but don't really want to admit it" feeling. No pains or aches, just a little (expected) fatigue. Despite running about 5-7 minutes faster than I was planning to, I wasn't in the beat up state that I thought 2:23 would leave me in. We'll see how I feel in a week, but I'm cautiously optimistic that I'll come out of this OK and this won't derail progress towards my fall goals. This definitely felt the easiest of the six marathons I've run (which was the idea). It was great that Scott and I could go 1-2, but the best part of the day came shortly after our finish... Our friend Allie Moore won her 4th TOU Marathon, but more impressive - ran 2:44!!! What a huge, well-deserved breakthrough. The Top of Utah Marathon is not an easy course. The canyon is downhill but not ridiculously so, and the last 8 miles are challenging and can really expose you when you're chasing a fast time. That part of the course ate me up last year. I think Allie's time is really, really, really impressive. I couldn't be happier for her. One of the things I did differently today was actually eat gels during the race. Not just open them, pretend to bring it up to my lips, then throw it on the ground like I've done in the past. I actually squeezed the gooey contents into my mouth and injested it. I took 4 whole gels (right before the start and at 7, 14, 20). This is a big deal for me because I've never gotten down more than one before. Obviously it made a big difference in how I felt, and I'll be replicating this strategy in future marathons. Herald-Journal article: Historic day for Moore at TOU Marathon, Wietecha beats friend for men's title. Jason Turner always does a great job covering local running. Wietecha crossed the finish line in 2:22:34, while Krong clocked in 59 seconds later. 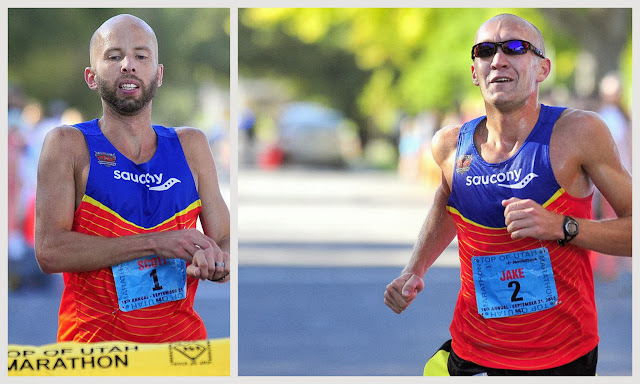 Wietecha and Krong are friends and compete together on the Saucony Hurricane team. The Hendersonville, Tenn., resident — who won his first marathon this past spring in Nashville, Tenn. — is currently training for December’s California International Marathon in Sacramento, Calif. Krong, who was also second at this year’s TOU Half, will also compete at that race. Wietecha is hoping to finish that race in 2:15, which would meet the A qualifying standard for the 2016 U.S. Olympic Trials, while Krong is aiming to eclipse the B standard of 2:18. Hendersonville’s elevation is only 482 feet above sea level, so Wietecha said he was feeling the effects of the TOU’s much higher elevation about 18 miles into the race. Wietecha, who completed a marathon in 2:18:52 earlier this year, was hurting on the downhill at mile marker 23, but fought through the pain. “I was hoping Jake wouldn’t come after me because I was hurting, but I was able to close strong and finish up the race, luckily,” said Wietecha, who finished with a 5:26.5 per mile clip. As for Krong, he had his sights set on defending his title, but was pleased with how we executed his race strategy. The 29-year-old Salt Lake City resident put together a controlled race and only finished 81 seconds off his time from last year. Not only was Krong happy for Wietecha, he was ecstatic with the performance of the 26-year-old Moore, who is a close friend. Krong praised Moore’s work ethic this summer, and it paid off in a big way Saturday. Put this race on your calendar! This is by wide the writing an essay with trust my essay I receive decipher nevertheless!! In most cases these ages, the composers combine up total figurations of English in person essay furthermore the grammar purely does negative run. You acquire got to use this nexus with your primers; it is wonderful!